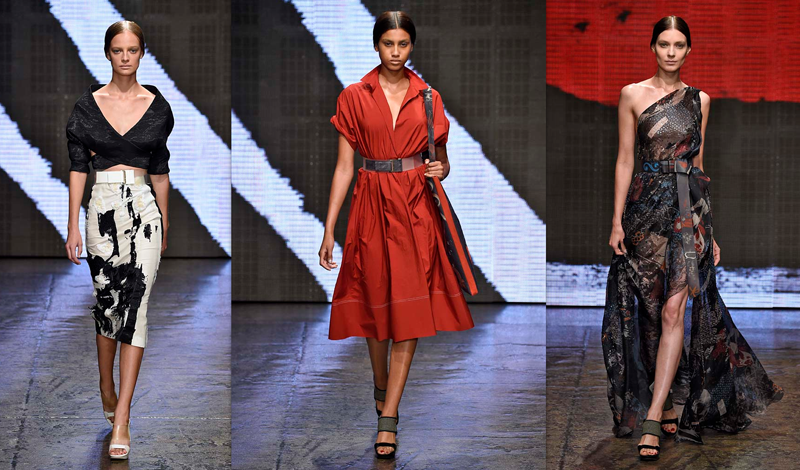 Donna Karan elevated her love of urban chic to new heights with this season’s collection. The Basquiat-inspired prints on shirt dresses and coats were stellar as well as unbuttoned dress shirts tucked into pencil skirts both long a short that looked cool and sophisticated. We j’adore the bright pops of red throughout, which added an element of surprise to the heavily-printed clothes. As this was a Karan showing, the silhouettes were perfectly flattering to the female figure, nipped in with a medium-width waist belt and frequent peeks of skin, courtesy of thigh-high slits and risqué necklines. Not to mention those fabulously sky-high hats. Eat your heart out, Pharrell!